Figure 5 of Querques, Mol Vis 2009; 15:2960-2972. Figure 5. Color fundus photographs, fundus autofluorescence frames and optical coherence tomography scans of patient FG07 and patient FG09. 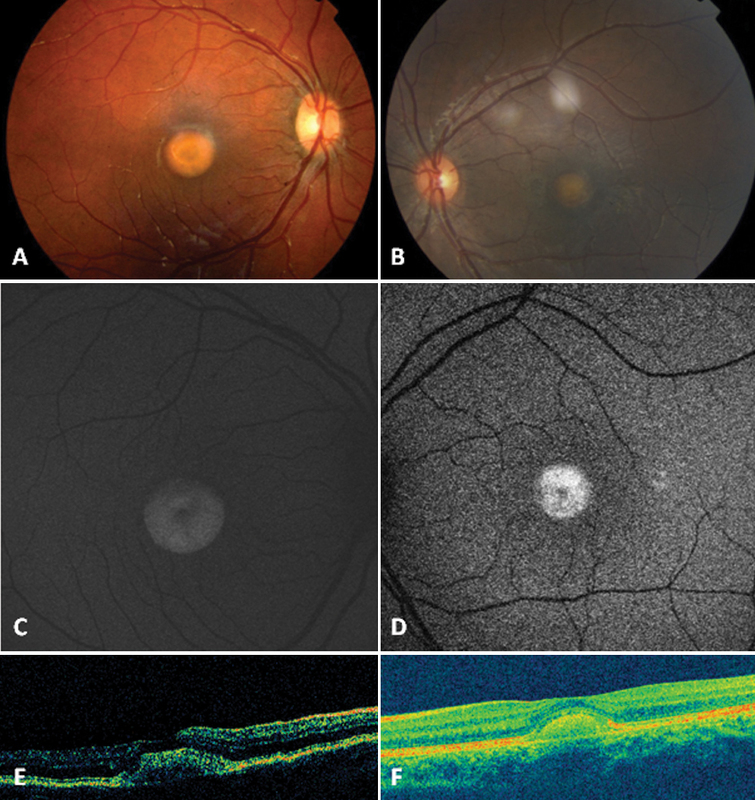 Color fundus photographs shows typical vitelliform lesions within the macula of patient FG07 (A) and patient FG09 (B). These vitelliform lesions appear highly autofluorescent on fundus autofluorescence (C, patient FG07; D, patient FG09), and as hyper-reflective dome-shaped lesions located between the hyporeflective outer nuclear layer and the hyper reflective retinal pigment epithelium layer, on both time domain optical coherence tomography (E, patient FG07) and spectral domain high-definition optical coherence tomography (F, patient FG09) scans.